Remember the bailout of 2008? Wall Street hucksters brought our economy to its knees and then demanded that we all pay them to keep their operations afloat. Blech! Nothing good came out of that … or did it? The Bicycle Commuter Act of 2008 was inserted into the bailout by Congressman Earl Blumenauer of Oregon’s 3rd District. A long-time bike advocate, Blumenauer traded his “Yes” vote for the bailout in exchange for this benefit – which he had lobbied for in prior years unsuccessfully. If you still have a job, Blumenauer’s bill allows you to be paid $20 per month, by your employer, to subsidize the purchase of a bike or bike equipment, up to $240 annually. The League of American Bicyclists maintains an information page on the Bicycle Commuter Act with information about the ins-and-outs of implementing it at your company. Pretty sweet, if you can convince your HR department to set it up! 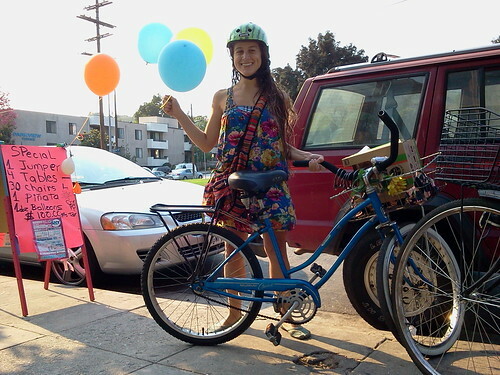 Sweeter still if it means you get a new bike and some new gear from Flying Pigeon LA (right? ).